Rob and I joined a gym today and I think it’s going to be a great thing for us. You see, the food here is TOO GOOD. I’ve gained 30 pounds in only 6 months of living here and if I keep going at this rate they’re going to be cutting a hole in the wall to get me out in just a few, short years. Dang! 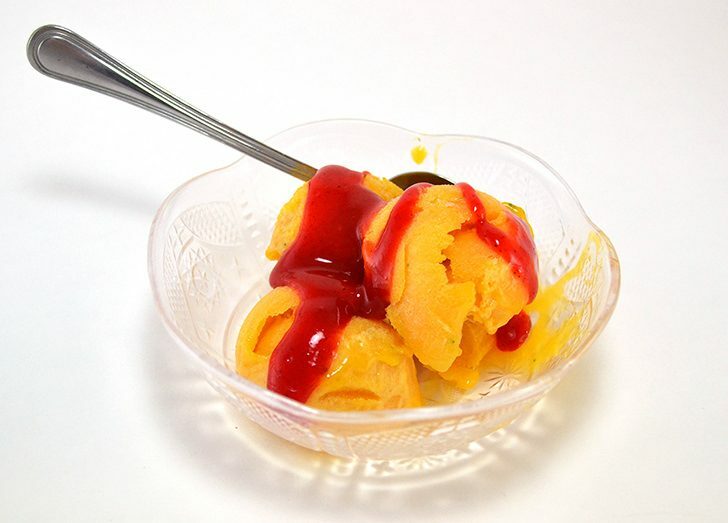 I must admit that one of the things that is causing me to gain is the mango ice cream they sell here. And since Rob and I have vowed to eat out less and eat more healthfully at home I’m working to make some of my favorite recipes that we can get at the snack stands but a whole lot cheaper and less awful for our waistlines! One of the things it seemed easiest to kick this off with was making a mango sorbet that was more fruit than anything and therefore lighter in calories. Now it probably doesn’t help that after Rob and I dipped into the stuff after supper one night that I went and got the carton and killed it while watching a show about the history of how awfully women have been treated. I don’t know why I watch half of the stuff I do but there you have it. 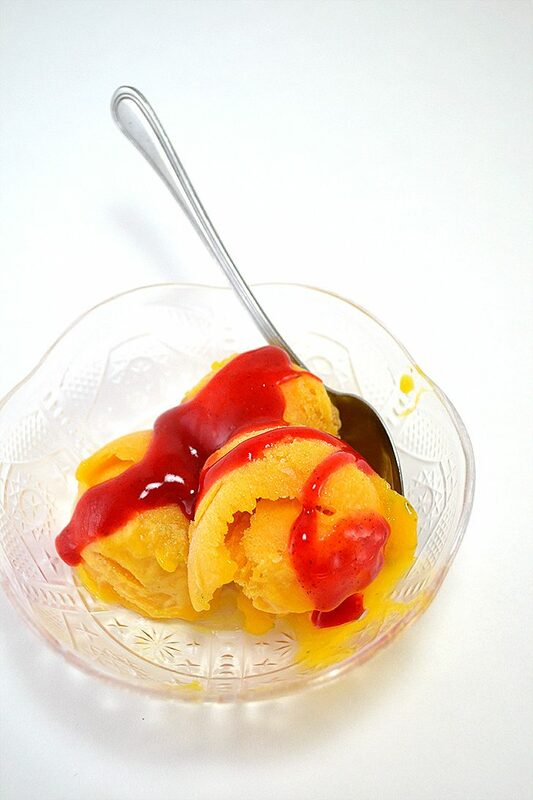 The best thing about this homemade mango sorbet is how creamy it is. You absolutely do NOT need dairy. There doesn’t need to be all of that fat added in there AT ALL. 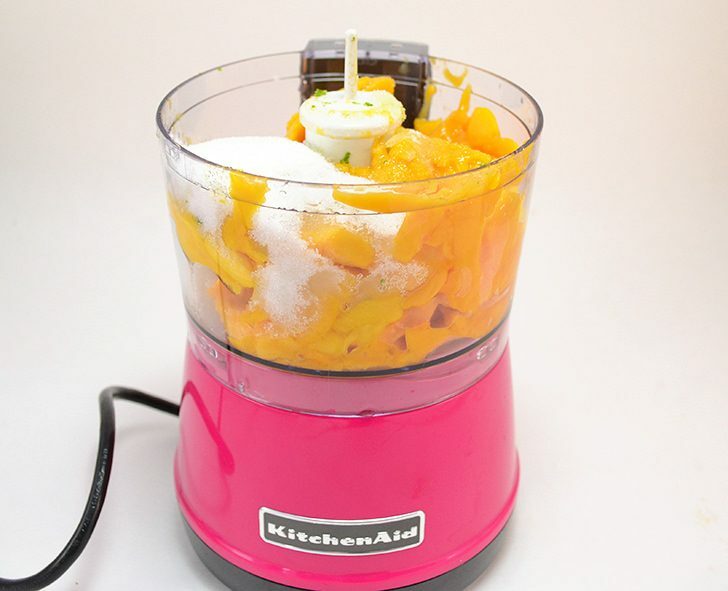 Mangoes are naturally rich, creamy fruits so why add anything to them? You don’t need an ice cream maker for this fab frozen treat. Grab some fresh mangoes and let’s hop to it! 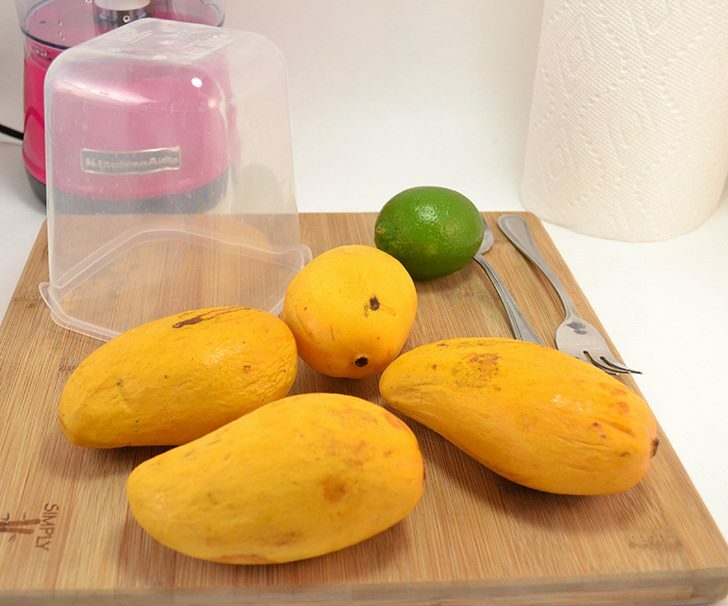 Cut your mangoes and remove all of the meat you possibly. can. I like to use a spoon to scrape the meat away from the skin. 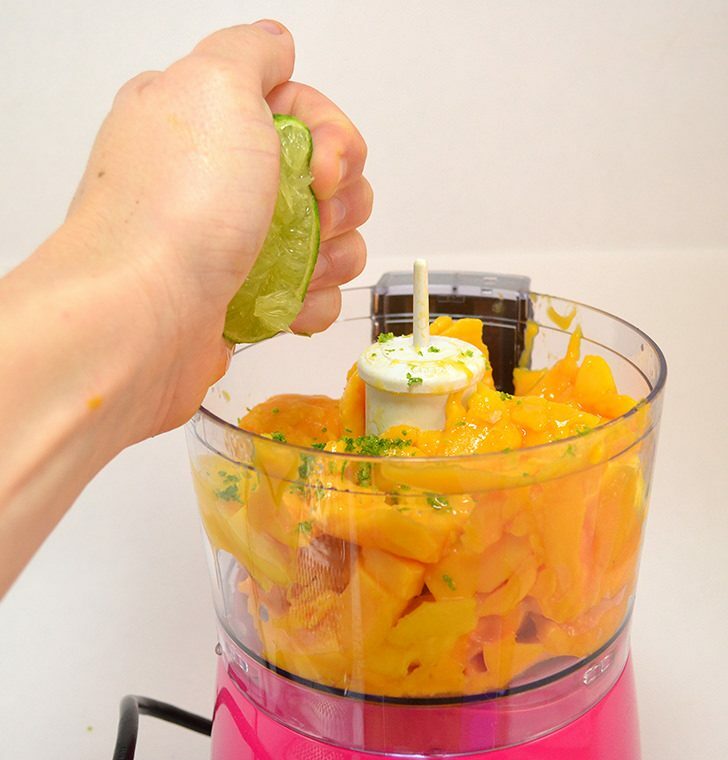 Place inside of your food processor. 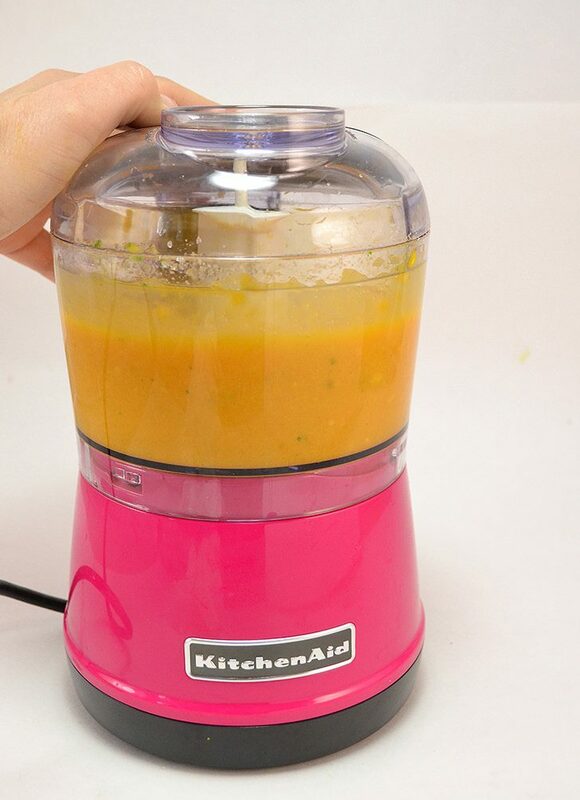 I got this hot pink Kitchenaid food chopper for less than $40 and it’s the best processor I EVER HAD. It’s small, only 2.5 cups but there are only 2 of is so it works out just fine. I can also puree or chop in batches if I really needed to. 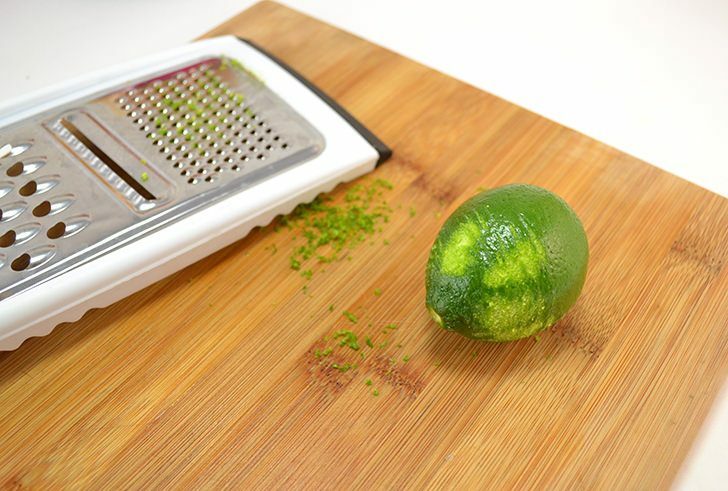 Grate the zest off of a clean lime. Roll the lime around on the counter and then juice the lime straight into the processor. Depending on how tart you like things you can adjust to taste. We use 1/2 an average sized lime for a slightly tart flavor. Add your sugar. Again, this is totally to taste. I use 1/4 cup but you can go up to 1/2 a cup if you like your sweets really sweet. It’s a good idea to give your fruit a quick taste to gauge if you should sugar with a lighter or heavier hand. If in doubt go for LESS. Once pureed you can taste and add more if necessary. Puree that business up until it is completely smooth. Place in a freezer safe plastic tub and freeze until solid. 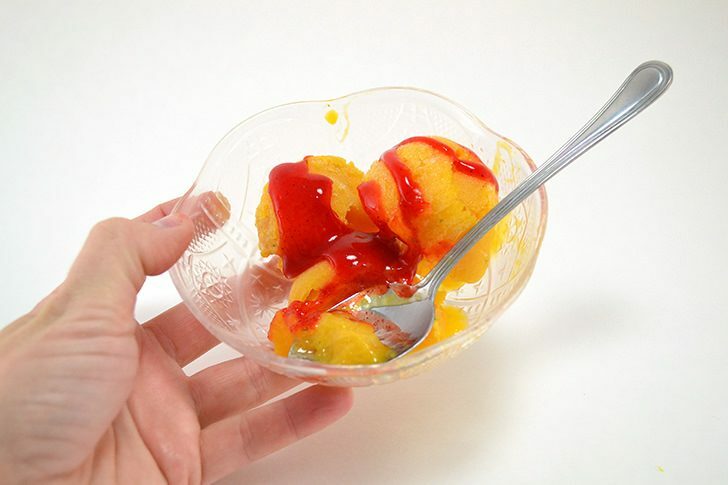 This tasty treat is amazing served alone or with chamoy, a Mexican sauce made with fermented fruit and chilis. It’s salty and spicy and I never thought I’d like it but I DO SO MUCH! :) It would also be pretty awesome with a raspberry sauce, too. Mmm! Whether you top it or eat it as is, this is a much healthier alternative to store bought ice creams and so cheap to make, too! With mangoes 3 for $1, this batch cost me less than $2! Oh, and did I mention it’s crazy creamy without any dairy? Blows my mind! Since you freeze it thoroughly do you have to let it sit out for awhile before you scoop it? 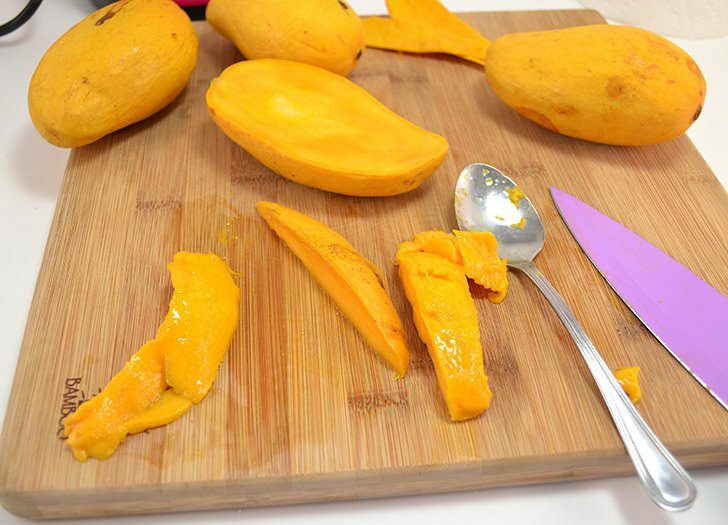 I’ve tried with two varieties of mango but not any other fruits. I plan to, just haven’t yet. Yes you absolutely do have to let it sit a minute because it will freeze hard as a rock! I will heat my scoop with hot water from the tap after letting it sit out for a few minutes and it is pretty perfect! I’d love to try this, do you need sugar to get it to freeze? to add sweetness then I use honey. * I lost 5lb in 1 week just doing this, and it’s stayed off. I did the same thing with salt with similar results and now I can not bear the taste of food that has sugar/salt added.